Pigeon bands provide a means of identifying birds individually. Racing pigeon breeders place these bands on their pigeons when the birds are young. The small metal or plastic strips remains around the birds' legs throughout their lives. These ID tags can settle disputes about who owns a bird and can help lost or injured pigeons get back home. Each band has a series of numbers and letters on it, separated by dashes; each of these has a unique meaning. The first set of letters on a pigeon band identifies which organization the bird is registered with. Each organization can track only those birds registered with it, so if you’re trying to identify a lost bird, the first set of letters is your starting cluet. Some of the most common pigeon associations in North America and their band letters are the International Federation, signified by the letters IF; the Canadian Pigeon Union, CRPU or CU; the National Pigeon Association, NPA; the Independent Pigeon Breeders group, IPB; and the American Union, AU. Local clubs within these organizations are represented by a unique letter or set of letters on the band. The club information is typically the third section on the band -- the second set could signify a couple of factors -- and may be a single letter, a set of two letters or a grouping of three letters. The parent organization has listing of all of the clubs registered with them and usually lists the groups on the org’s website. Within each local pigeon club every bird is given a serial number. 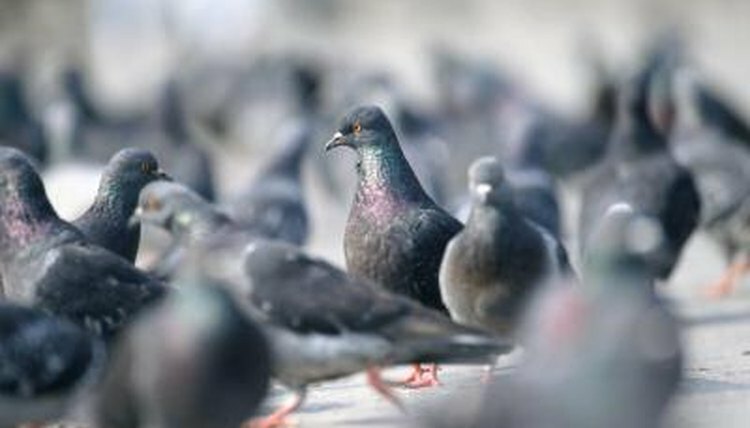 A specific number is never given to more than one bird in the group and provide a means of identifying the specific pigeon. The serial number is usually a four-digit number, but it may be longer or shorter depending on the size of the club. The placement of the serial number on the band depends on the parent organization but it is generally found immediately after either the parent organization’s information or the club’s identification. A two-digit number on the band in either the second or the fourth position represents the year the pigeon in question was hatched. Even though this number and the serial number may show up in the same spot, it’s easy to tell which is which, since the birth year is always a two-digit number while a serial number is longer. Some pigeon owners aren’t affiliated with any club; their birds' bands typically have the owner’s name and contact information such as a phone number, address or email address. In some cases, keepers put such bands on their birds in addition to the club bands to make it easier for lost birds to get home if someone finds them.